Antoine’s is one of the most traditional restaurants in New Orleans—and in America—a place where familiarity is part of the charm. When the tuxedoed waiter set the first course down in front of me, I knew this was not your typical dinner at Antoine's. The plate was packed with about as many flavors as you can fit into an appetizer. And it was octopus—octopus alla plancha with compressed watermelon, corn, olive and tomato tapenade paired with tuna crudo, eggplant caponata and basil, to be precise. "Has anyone ever served octopus at Antoine's before?" I asked the rest of the table. Not likely. 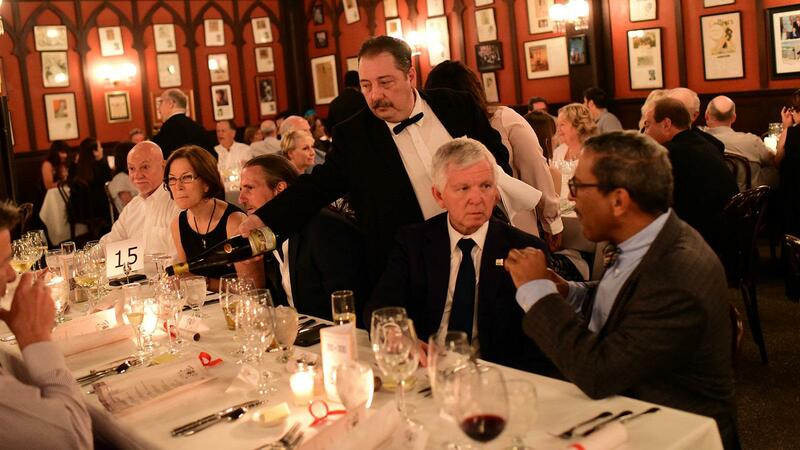 Earlier this summer, I attended a special dinner celebrating New Orleans' 300th birthday at its oldest restaurant. In fact, Antoine's, opened in 1840, is America's oldest continuously operating restaurant. It's one of my favorite places to dine—a slice of history that exists nowhere else on earth. Tradition defines Antoine's, and if that's not what you want for dinner, you go elsewhere. Regular customers call their longtime waiters when they want a reservation. The cavernous annex dining room and numerous private dining rooms, many named for Mardi Gras krewes, are bedecked with old photos and trinkets from the restaurant's past. The menu hasn't changed much in 178 years—the last notable addition came two decades ago when they added English to complement the French—and most regulars don't order off the menu anyway. They stick to their usual dishes, varying them slightly based on what fish is fresh. Yet this dinner wasn't about tradition. Partnering with Todd Price, food and drinks writer at The Times-Picayune, Antoine's executive chef Michael Regua invited eight chefs from other New Orleans restaurants—including legendary Bayona chef Susan Spicer and local icon Frank Brigtsen—to collaborate on a 300th birthday meal showcasing the city's many cultural influences. Cocktail specialists Neal Bodenheimer and Nick Detrich mixed up historic drinks, and Republic Distributing selected wines to match the food. New Orleans chefs teamed up, including, from left, Adolfo Garcia, Susan Spicer, Michael Regua and Nina Compton. But can you showcase New Orleans' foodie future in its oldest hall of tradition? Before we sat down, as we sipped Sazeracs and St. Charles Punch, that was the main topic of conversation. And how would outside chefs work in Antoine's kitchen, where tradition comes with a generous pinch of insularity? Several of the chefs told me later that they had worried about working with the Antoine's waiters, known for their pride and fierce independence. Those fears proved unfounded. The chefs found that the Antoine's staff were team players—their pride was rooted in making their restaurant shine, and it did. And the food? Fantastic. The octopus dish showed how well the cooks played together, bringing together Nina Compton of Compère Lapin, who comes to New Orleans from St. Lucia via Miami, with Nick Lama of Avo, whose Sicilian-American family has been in New Orleans food for generations. An S.A. Prum Ürziger Würzgarten Riesling Kabinett 2009 kept all the flavors from bogging down. The third course, perhaps my favorite for its unabashed fun, crusted fried red snapper with the dried shrimp popularized by the city's Vietnamese community, embellishing it with oyster cornbread dressing, blue crab court bouillon and a Rockefeller hollandaise sauce. “We wanted to see how many kinds of seafood we could get in one dish,” explained DTB executive chef Carl Schaubhut of his collaboration with culinary instructor Kevin Belton. The verve, richness and ripe peach flavors of the Louis Jadot Pouilly-Fuissé 2016 stood up tall. Antoine's waiters, some of whom have worked there for decades, served Compton and Lama's octopus alla plancha. From drinks to dessert, the night was a fabulous blend of Antoine's tradition with the innovation of New Orleans' current pantheon of chefs—and a fitting tribute to the city on its tricentennial. New Orleans is much like Antoine's—tradition fills the air like thick humidity. Every season, from Mardi Gras to Jazz Fest to Réveillon dinners at Christmas, is filled with rituals. We do a lot of stuff down here because people have always done it. That provides comfort and roots, even to someone like me who has only lived here eight years. It can also mean stagnancy and decay. Antoine's flirts with that risk every day. I love the history, the style and, most of all, the people there. It is OK to seek comfort and tradition in fine dining. But I wish the food was more consistent. And while the wine program has been admirably rebuilt since Hurricane Katrina, it could be far more ambitious. But even Antoine's has innovated. CEO Rick Blount has brought stability to a restaurant that almost didn't survive the hurricane's aftermath. The owners converted a dining room into the streetfront Hermes Bar, making Antoine's approachable and fun. I hope they build on that momentum. You don't need to throw out tradition to innovate. New Orleans is 300 years old, but it still has new in its name. Here are questions for you: Where do you eat when you are looking for comfort and tradition, and where do you eat when you want innovation? Do you know someplace that serves both? See the full dinner menu above. I enjoyed your post about Antoine's, a terrific restaurant in one of the country's great dining cities. One correction however: America's Oldest Restaurant is the White Horse Tavern in Newport, RI, which was established in 1673 (the building is even older). The White Horse is still housed in it's original structure, offers some of the finest dining in southern New England and is a multi-year Wine Spectator Award of Excellence winner. It's a fantastic experience that you should come enjoy! I did say that Antoine's is America's "oldest continuously operating restaurant" - that appears to have been oversimplified in the headline. There are older venues, but I don't know of any that have kept their doors open continuously. What's more, Antoine's has been run by the same family all this time. Now, it's possible there's an older restaurant I missed. But that's just a good excuse to go try it. I love Newport and will have to visit the White Horse on my next trip there. It sounds fantastic.